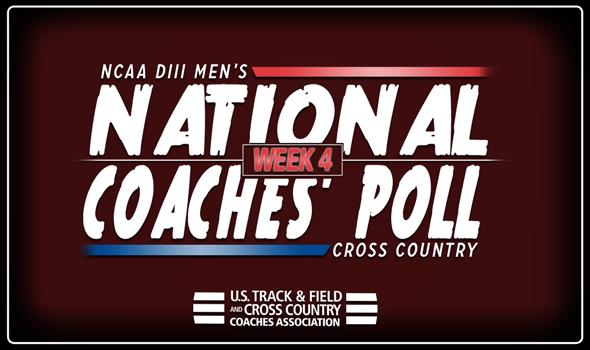 NEW ORLEANS – Want an idea of how much changed between Week 3 and Week 4 in the NCAA Division III Men’s Cross Country National Coaches’ Poll? Out of the 35 teams that were ranked in Week 3, only three remained in place one week later: No. 1 North Central (Ill.), No. 16 MIT and No. 26 St. Lawrence. The Cardinals are unanimous once again and it’s hard to imagine them leaving the nest any time soon. North Central (Ill.) ventured to the Louisville Cross Country Classic this past weekend and put on a clinic against a number of NCAA Division I programs. The Cardinals won the team title with 102 points as they put six runners in the top-50 and had a 1-5 spread of 49 seconds. RPI jumped one spot to an all-time high No. 2. The Engineers designed a masterpiece as they steamrolled the field at their own Saratoga Invitational. RPI, led by Sean O’Connor (first place) and Grant O’Connor (second place), put all seven of their varsity runners in the top-20. Pomona-Pitzer has never been ranked higher than No. 3, a spot it occupies this week. The Sagehens finished third at the Capital Cross Country Challenge behind NCAA DII Chico State and NCAA DI Pepperdine. Andy Reischling led Pomona-Pitzer with a fifth-place finish as he covered the 8K tract in 24:17.7. UW-La Crosse made the biggest jump into the top-10 as it went from No. 12 to No. 4. The Eagles were ranked in the top-5 in the preseason and Week 1, but fell out of favor. Now UW-La Crosse is back again following a strong effort at the Loyola Lakefront Invitational. The Eagles, who finished sixth as a team, took down former No. 2 Washington (Mo.) at the meet. Carnegie Mellon jumped six spots from No. 13 to No. 7, its first time in the top-10 since 2016 and its best ranking since 2008. The Tartans barked up the right tree at the Paul Short Run when they finished 11th in the Gold Race between No. 5 Haverford (10th) and NCAA DI Georgia (12th). Wartburg dominated the Dan Huston Invitational this past weekend and was rewarded with its best ranking since 2006. The 11th-ranked Knights scored just 35 points at the meet and were led by Sam Pinkowski’s runner-up effort. Two teams that stood out at the Blugold Invitational this past weekend helped their cause a bit. UW-Stout, the meet champion, went from No. 22 to No. 18, while third-place UW-Eau Claire vaulted from the Land of the Not Ranked to No. 20. St. Olaf finished runner-up and fell one spot from No. 18 to No. 19 this week. UW-Eau Claire is one of seven new teams to join the top-35 this week: No. 22 Bowdoin, No. 24 Berea (Ky.), No. 25 Otterbein, No. 30 St. Thomas (Minn.), No. 33 Washington and Lee and No. 34 Rowan are the others. This is the first time the Polar Bears have been ranked in the top-35 since 2014, while it is just the sixth time in the past 21 years that the Cardinals have been in the same position. Be sure to check back throughout the season as the National Coaches’ Poll will continue to evolve ahead of the 2018 NCAA Division III Cross Country Championships on Saturday, November 17 in Oshkosh, Wisconsin.